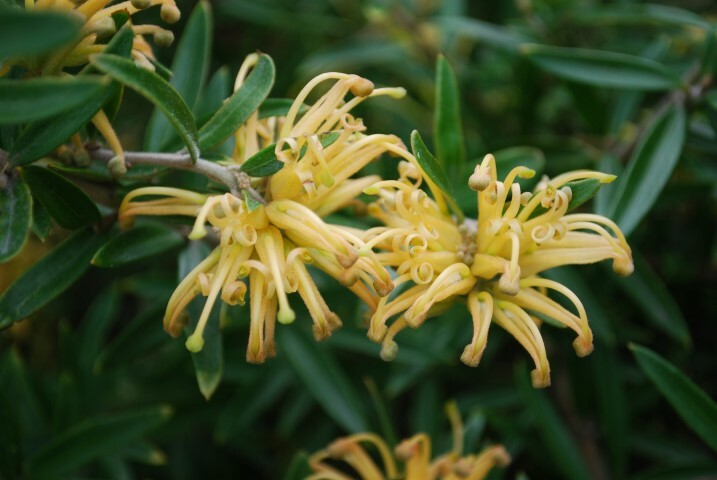 Grevilleas are among the most popular native plants in Australian home gardens and flower most of the year. Their striking, nectar-rich flowers are like a larder for native birds and can be an important food supply at times of year when other food is scarce. Grevilleas grow in rocky or sandy soils and must have excellent drainage, so if your soil is heavy clay, build up the soil in mounds or plant into raised garden beds rather than dig into the ground. Improve the soil by mixing in a little Searles Real Organic Compost and sprinkle Searles Penetraide Re-Wetting Granules. Planting on slopes can also improve drainage. Keep grevilleas lightly mulched, especially while establishing, and water during dry spells. Fertilise in early spring and late summer with Searles Kickalong Native Organic Plant Food and never feed grevilleas with a fertiliser that isn’t especially formulated for natives. – Grevillea Robyn Gordon: features deep red flowers as a small shrub. – Grevillea Tucker Time New Day: features pink-red flowers and growing approximately 50cm high. – Grevillea Cherry Pie: features shiny red flowers and grows approximately 2m high. – Grevillea Bush Picnic: features pink and cream flowers as a small shrub. – Grevillea Jelly Baby: features deep pink flowers as a small shrub. – Grevillea Bon Accord: features clusters of pretty pink flowers and grows approximately 2m high.